This quote paints a beautiful picture of the wild, roaring waters that once existed in the Grand River. In fact, if not for its namesake rapids, Grand Rapids would not exist. 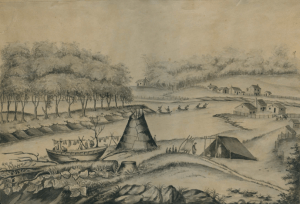 The rich fishing and trapping grounds made possible by the rapids attracted three groups of Anishinabek, the Ottawa, Ojibwe, and Pottawatomie tribes, to the baw-a-ting, or the rapids, over 300 years ago. They gathered, traded, and used the river and the surrounding area for ceremony. These groups still use the river today. In the early 1800s, English settlers migrated to the area to trade with the local tribes. The first trading post, established in 1826 by French trader Louis Campau, laid the groundwork for further settlement and, eventually, incorporation of Grand Rapids as a city in 1850. 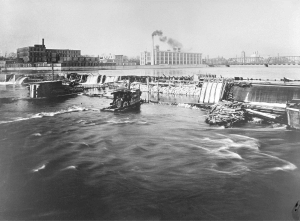 As industrialization took hold, the primary use of the Grand River changed. In the late 1800s/early 1900s, the river was diverted to power stations, islands were removed, the river bottom was graded, and a series of five low-head dams were constructed to ease the transport of logs from the hard and softwood forests upstream. As a result, the defining feature of Grand Rapids was removed and the identity of the City re-centered on its furniture industry. To learn more about the history of the Grand River, Grand Rapids, or any artifacts, please visit Grand Rapids Public Museum’s Online Collections here.